Man Of The Match David Tubridy celebrates a point for Clare during their National League game against Cork at Cusack Park Park. Photograph by John Kelly. CLARE came out the right end of an absolute classic in Semple Stadium this afternoon to retain their Division Two status in dramatic fashion. A late Keelan Sexton goal was the difference maker as momentum swung back and forth before points from Gary Brennan and Tubridy sealed the win. Tipperary started like a house on fire and had 1-1 in the first three minutes through captain Conor Sweeney. The goal coming after Philip Austin spilt the defence and rounded Robert Eyres before spying Sweeney free at the edge of the square. He had a simple fist to the net to open the scoring. Gavin Cooney opened Clare’s account after five minutes when he beat his man and popped the ball over. Five minutes later he had a goal when a Gary Brennan’s shot hit the post and fell into his arms and he had the simple task of finishing the goal. Just the slice of luck Clare needed after a bad start. Sean O’Donoghue then added a point but his opposite number was on fire and after 18 minutes, Sweeney had 1-5, and put Tipp two points to the good once again. Clare then scored four points in five minutes with Jamie Malone getting two, as Eoin Cleary and David Tubridy opened their accounts also to recapture the lead for the Banner. Tipperary then had their purple patch and stamped their authority on the game with eight points in the final 12 minutes of the half. 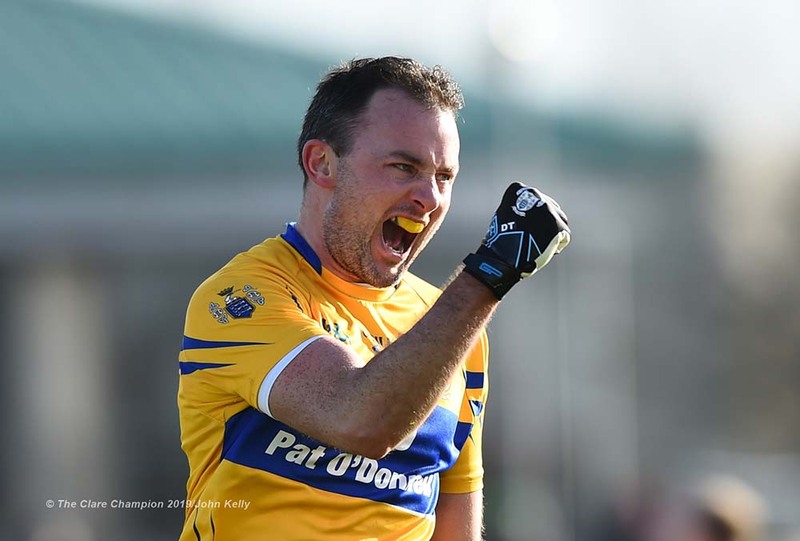 Six different players chipped in with points as Clare struggled to cope with Tipperary’s swarming attacks from midfield and the half-time whistle came at the right time for Clare but they had five points to find to remain in Division Two. David Tubridy got a score right after half-time before sub Keelan Sexton kicked a fine pint from the left-hand side to bring the gap back to three. Eoin Cleary then got his third, a peach of a strike before scoring a monster free to make the gap two. Gary Brennan then slotted a fine point before David Tubridy cleverly finished to the bottom corner as he went through one-on-one. The floodgates had opened and Clare led by three. Points from Liam McGrath and Sweeney brought the gap back to one before a McGrath free levelled affairs once more in a thrilling and high-scoring game in Semple Stadium. A Sweeney free then edged Tipp back in front to ensure a nervy final ten minutes. A fine Steven O’Brien point put two between the sides before Sweeney converted his close-in mark to make it a three-point game and have Clare fighting for their lives. Kieran Malone was nearly the hero for Clare as with five to go his shot on goal was well saved by Evan Comerford in the Tipp goal to keep the gap at three. Comerford had no such luck a few moments later as Keelan Sexton finished cleverly having been played in by Kieran Malone. 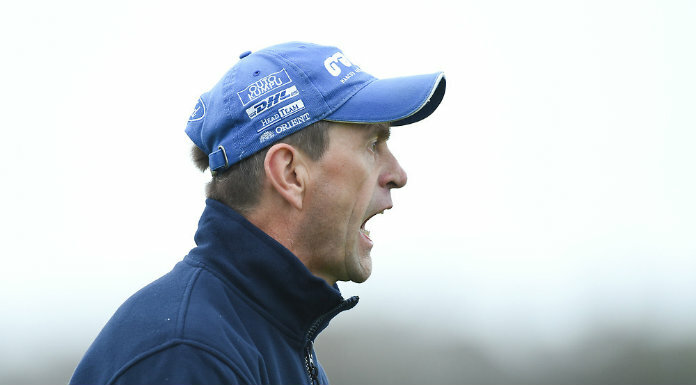 Gary Brennan and a monster free from David Tubridy ensured that Clare hung on to their Division Two status in a gripping game. Clare: Robert Eyres: Kevin Harnett, Cillian Brennan, Gordon Kelly; Conall O’hAinifein, Dean Ryan, Cian O’Dea; Gary Brennan, Cathal O’Connor; Eoin Cleary, Seán Collins, Jamie Malone; Gavin Cooney, Seán O’Donoghue, David Tubridy. Tipperary: Evan Comerford; Alan Campbell, John Meagher, Emmett Moloney; Kevin Fahey, Daire Brennan, Paul Maher; Steven O’Brien, Liam Casey; Jack Kennedy, Liam McGrath, Brian Fox; Philip Austin, Conor Sweeney, Michael Quinlivan.